Travel from Phuket to Ko Lanta by ferry, taxi or minivan and speedboat transfer. See our Phuket to Ko Lanta travel guide for timetables and prices. The fastest option is the Express Transfer. The cheapest option is the Ferry. Ferries from Phuket to Ko Lanta depart daily. The ferry departs from Rassada Pier in Phuket. The ferry arrives at Saladan Village on Ko Lanta. The ferry briefly stops at Ko Phi Phi on the way from Phuket to Ko Lanta for passengers to get off and get on. The total travel time is around 2 hours and it’s a scenic trip across Phang Nga Bay. (Don’t forget to wear sunscreen if you stay outside on the deck!). However, be aware the ferries are slow and often depart late. If you are travelling with a lot of luggage, be advised you will need to carry your own bags and walk up and down staircases on the ferry. Luggage is stored in a big pile on the ferry. When you arrive at Ko Lanta and get off the ferry, you will be at the ferry pier in Saladan Village, which is the main port of entry on the island. Saladan Village is located at the top of Ko Lanta. 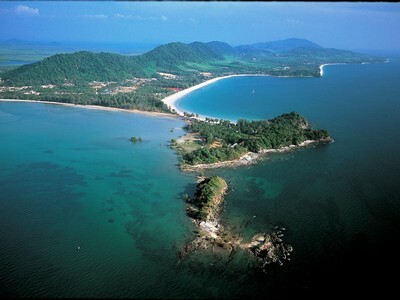 Most of the beaches run down the east coast of Ko Lanta. You will need to hire a tuk tuk or a taxi when you arrive at Saladan to take you to your hotel. (Read our recommended Ko Lanta hotel shortlist if you need suggestions of where to stay). Travel time from Saladan to the beaches is 5 minutes to an hour, depending how far south the beach is located. 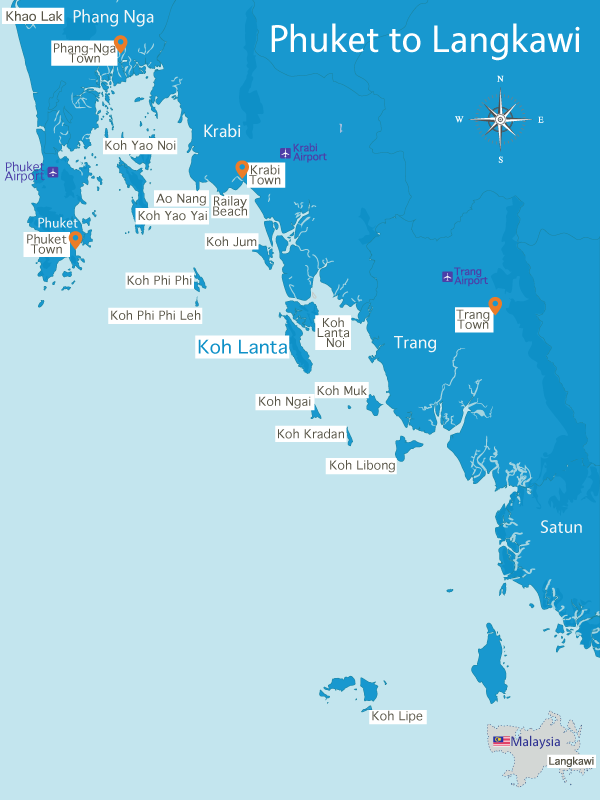 See our Ko Lanta map for more information. You can check prices and departure times and book ferry tickets online. View the Phuket Rassada Pier to Ko Lanta ferry and the Phuket Hotel Pickup to Ko Lanta option. If you need to go from Ko Lanta to Phuket, see this Ko Lanta to Phuket ferry page for timetables and pricing. Be aware there are numerous different ferry operators from Phuket to Ko Lanta with different timetables. Most of them stop at Ko Phi Phi. Check how long the ferry stays at Ko Phi Phi before moving on to Ko Lanta. Some services stop at Ko Phi Phi for several hours before continuing, which can make your total journey time quite long. The minivan collects you from your Phuket hotel and drives you from Phuket through Phang Nga and to the Krabi speedboat pier. This is about a 3 hour drive. After you arrive at the Krabi speedboat pier, you then transfer to a speedboat which takes you across to Ko Lanta. The speedboat ride is about 15 minutes. When you arrive on Ko Lanta, there is a pickup truck waiting for you which then transfers you to your Ko Lanta hotel. Please note: the speedboat does NOT cross the ocean direct from Phuket to Ko Lanta. To do so is quite a long, uncomfortable ride – around 90 minutes and very bumpy, which makes many passengers seasick. Therefore the combination of minivan transfer and speedboat to beat the car ferry queues onto Ko Lanta is a more comfortable choice. See pricing and book the Phuket to Ko Lanta Express Transfer. The Phuket to Ko Lanta taxi option takes you door to door from your Phuket hotel to your Ko Lanta hotel. The minivan is private, meaning it’s just for you and your friends and family. No other passengers are picked up during the journey. Once you have been picked up, the taxi takes from Phuket through Phang Nga and into Krabi, where you arrive at the Ko Lanta car ferry pier. This about a three hour drive. You then go onto the car ferry to Ko Lanta Noi, the island next door to Ko Lanta. Once you arrive on Ko Lanta Noi, you drive across the island and then cross by bridge over to Ko Lanta. The driver then goes direct to your Ko Lanta hotel. This option is slower than the Express Transfer because you have to wait for the car ferry which often has long queues in high season (November to April). The total travel time is 4 to 5 hours depending on the car ferry and your hotel location on Ko Lanta. If you are not in a hurry, it’s a great option.